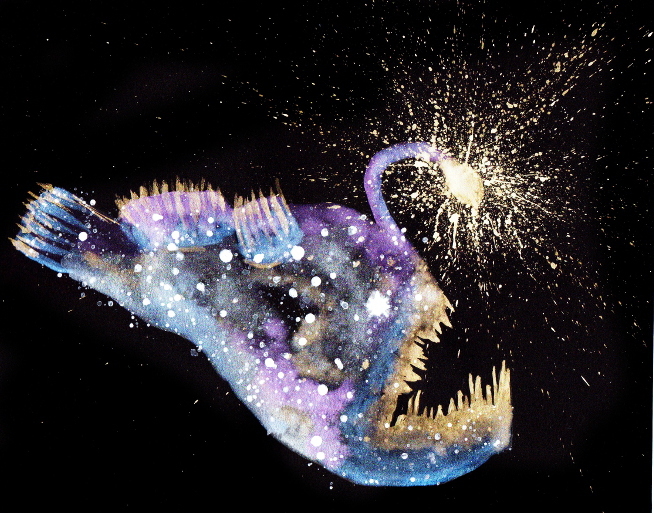 Anglerfish symbolizes the unseen world, navigating darkness, and luring energy. Anglerfish have a symbiotic relationship with bacteria, giving it the ability to glow with bioluminescence. Bacteria are part of the “unseen” world. Anglerfish reminds you that by strengthening your relationship with the various layers of the unseen world, you will be able to see and navigate deeper truths and emotions than most. Anglerfish have highly attuned organs that sense the changing pressures and movements in the water. When you feel your surroundings shift, trust it and reposition yourself accordingly. You are picking up information from the unseen world that guides you in ways that the mind cannot understand. Anglerfish have a glowing lure that reaches out from their 3rd eye to help them navigate in the dark as well as attract nourishment into its life. When traversing the deepest, darkest places in your life remember to turn on your own light to guide you through. Trust in your ability to see. I want to hear about your Anglerfish experiences. What stories or dreams have you had? Please share and join in the conversation below!